This view looks north at Downtown Cheyenne from the Central Avenue viaduct carrying Interstate 180 over the Union Pacific Railroad. 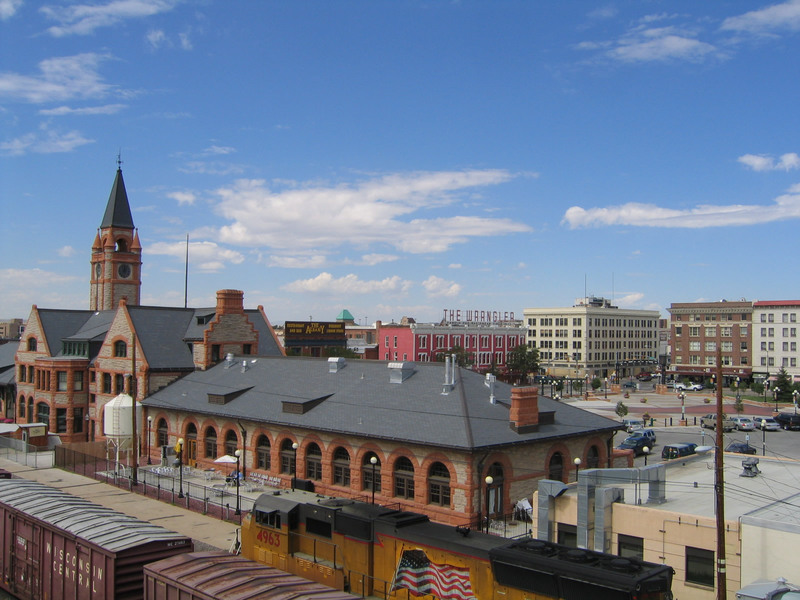 The iconic Cheyenne Depot sits alongside the railroad and anchors Cheyenne Depot Plaza. Colorful buildings such as The Wrangler along Capitol Avenue surround the plaza. Business Loop I-80 and U.S. 30 (Lincolnway) pass along the northern edge of the plaza. A part of the historic Lincoln Highway, this major arterial offers direct access to the city center from Interstate 80. Photo taken 09/06/05. Through the capital city of Cheyenne, Business Loop I-80 follows a significant portion of U.S. 30 along Lincoln Way. The business route branches northeast from I-80 just ahead of the cloverleaf interchange joining the freeway with Interstate 25. Representing the principle east-west arterial through Downtown Cheyenne, Lincoln Way continues through the residential street grid to Wyoming 212 (College Drive). Business Loop I-80 returns to I-80 via College Drive south to Exit 364. Trailblazers direct motorists departing from the Little America Hotel & Resort to Business Loop I-80 (West Lincolnway) to adjacent on-ramps for both I-25 and I-80. Photos taken 08/11/14. Guide sign posted at the end of the loop ramp connecting I-25 & U.S. 87 north with Business Loop I-80 & U.S. 30 (Lincolnway). Photo taken 08/11/14.